November 2013 – The day before the pommel horse final at the world championships in Antwerp, Alberto Busnari celebrated his 35th birthday. But he was also celebrating 30 years as a gymnast. “Gymnastics is my world, it’s my life,” the engaging Italian tells us. 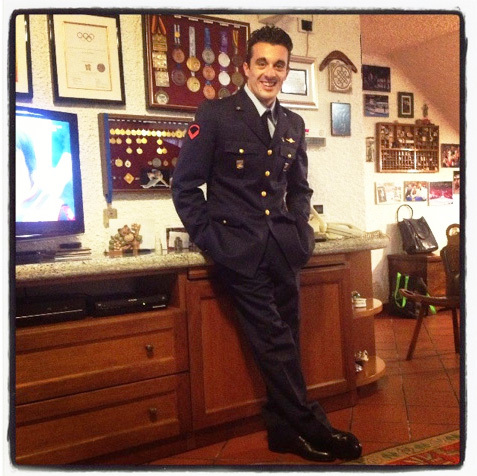 Alberto is a member of Centro Sportivo Aeronautica Militare – the sports club of the Italian Air Force, which he joined in 2004. “I have so much gratitude for them,” he says, “because they give us the opportunity to continue our gymnastics training – it’s my job.” Whilst he may not be flying fighter jets, he can continue flying high in the gym with no financial worries. As well as optimising the efficiency of his training as he got older, there was another reason why Alberto decided to focus on fewer events. “I have a big problem with my knees. They are not in line, in fact I was born with them out of alignment and they sometimes dislocate. I have always known that my legs were not so good. In 1995 I had an operation on each knee, and after tearing the muscles of my left leg twice – in 1997 and again in 2006 – I changed my gymnastics so it involved less jumping and running”. Although he competed on his three key events at the 2012 Olympic Games in London, it is on the pommel horse where he excels. He even has an element named after him: a handstand movement that travels along the horse. Very few gymnasts have the accolade of a move named after them, but these days, many gymnasts aspire to perform the Busnari in their routines. By Antwerp, he was able to perform his signature move not just once or twice, but three times in succession. The complexity of the routine meant he was the highest scorer on pommel horse in qualifications. Things were looking good for a medal in finals for the persistent Italian, hoping to make up for the disappointment of placing fourth at the European championships a few months earlier, and fourth at the 2012 Olympic Games.